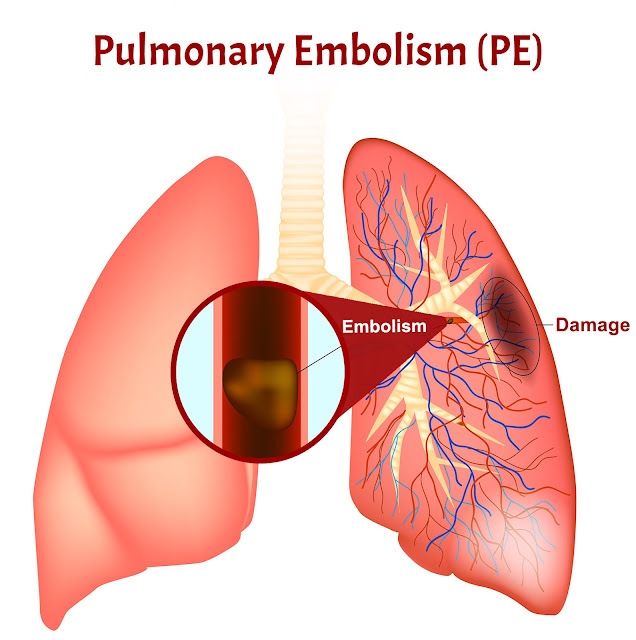 Home » Health » What Is Pulmonary Embolism? Pulmonary Embolism is a condition when the pulmonary arteries ( blood vessels that carry blood from the heart to the lungs ) are blocked, usually due to blood clots origination from the legs or other body parts. The size of blood clots that are clogged is mostly small enough to not endanger life. However, even the smallest amount of blood clots can damage the lungs. People with pulmonary embolism need treatment as soon as possible to reduce the risk of lung damage. It will be very dangerous, if the size of the blood clot is large enough to stop the flow of blood to the lungs. The risk of death from pulmonary embolism can be drastically reduced by undergoing appropriate treatment. Coughing that occurs is usually a dry cough, but can contain phlegm or blood. Sharp pain in the chest or upper back. These symptoms will be felt more when the patient tries to take a deeper breath, cough, eat, and when bending. This symptom is similar to a heart attack. Shortness of breath . These symptoms can appear suddenly and can get worse. The skin of the fingertips and lips turn blue . The heart beats faster and palpitates. Pain or swelling in the legs, especially the calf. Many cases of pulmonary embolism are caused by blood clots in the legs that are carried into the lungs, so that many pulmonary embolism sufferers also show symptoms of pain, redness, and swelling in one leg (usually in the calf). Immediately consult a doctor if you experience shortness of breath, pain in the chest, coughing, expelling phlegm accompanied by blood, or pain that accompanies swelling in the legs. Fat from a long broken bone marrow. Blood clots too easily. A person's risk of developing pulmonary embolism will increase if the blood is too easy to clot. Inactive body If you do not move the body for a long time, blood in the body tends to collect in the lower body, especially at the bottom of the foot. This will increase the risk of blood clots forming. Injuries to blood vessels. Damaged blood vessels can narrow or become blocked, and cause blood clots to form. This condition can occur due to fractures, severe muscle injury, vasculitis, or side effects of certain chemotherapy drugs. Pregnancy. The risk of developing pulmonary embolism will increase up to six weeks after giving birth). Currently undergoing cancer treatment, such as chemotherapy or radiotherapy. Suffering from thrombophilia (easy blood clots). Have family members who have had pulmonary embolism. Suffering from heart disease or cancer. Currently taking contraceptive pills or undergoing hormone replacement therapy. Diagnosis of pulmonary embolism is sometimes difficult. This is because the symptoms are the same as heart attacks, asthma, pneumonia, or panic attacks. Carefully diagnosing pulmonary embolism is important, because the treatment process is not easy and can cause side effects. Blood gas analysis. This test will detect a sudden drop in oxygen levels in the arteries, which is one symptom of pulmonary embolism. Blood test. This test serves to look for an element called D dimer (a protein in the blood that appears after a decomposed blood clot). If D is dimer high, then there is a blood clot that is released and circulates in the blood vessels. The clot has the possibility to clog the pulmonary artery. Scanning CT scans, MRI, and ultrasound will be advised by the doctor to see the position of blood clots that occur. A CT scan serves to ensure that the symptoms that arise are not due to enlargement of the heart or pneumonia. Especially for pregnant women, MRI will be advised to protect so that the fetus is not exposed to radiation. Ventilation-perfusion scan . This test serves to show airflow and blood in the lungs. If the result is a part of the lungs filled with air in the absence of blood, it may be caused by pulmonary embolism. Pulmonary angiogram . This is the most accurate test for diagnosing pulmonary embolism, because it will give images of blood flow to all the arteries in the lungs. Because pulmonary angiograms have a high degree of difficulty, this test will usually be recommended when other tests fail to get the right diagnosis. Giving medicine . The medication given to patients with pulmonary embolism is anticoagulant and thrombolytic. Anticoagulants function to inhibit the formation of blood clots. While thrombolytics are to break blood clots. However, thrombolytic drugs are at risk of causing sudden and serious bleeding, so this drug is only used when the patient's condition is critical. Blood vessel filter . This screening procedure is usually intended for people who are not suitable for anticoagulant drugs, or if treatment with anticoagulant drugs is not effective. The function of this filter is to hold blood clots in order not to get carried into the lungs. This filter will be installed on the main back vein that connects the two legs with the right heart. Operation. If the blood clot is too large, and threatens the life of the patient, chances are the doctor will dissect the pulmonary artery through an embolectomy procedure, to remove the blood clot. Combining ultrasound procedures and tromboli drugs This procedure uses high-frequency and low-energy sound waves, combined with the administration of thrombolytic drugs to break blood clots. This step is done to deal with cases of pulmonary embolism that are quite severe. Blockage of the pulmonary arteries that are not treated properly can lead to pulmonary hypertension. Pulmonary hypertension is a condition in which the blood pressure in the lungs and the right side of the heart is too high. The heart will constantly pump blood through high vessel pressure, as a result it can weaken the heart muscles. If it is not treated immediately, the lung tissue that is blocked by blood clots will die or is called pulmonary infarction. This makes the lungs more difficult to provide oxygen for the whole body. Take anticoagulant drugs according to your doctor's prescription. Lifting your legs higher, especially when lying on the bed at night. Wear compression stockings on the legs. These stockings will make blood flow faster. The purpose of some of these activities is so that the blood in the legs can flow more smoothly. In addition, not smoking, eating healthy and balanced foods, exercising regularly, and maintaining weight can also reduce the risk of developing pulmonary embolism. 0 Response to "What Is Pulmonary Embolism?"